Using recently processed data from the Galileo probe, NASA-JPL software engineer Kevin Gill created this low-altitude flyover of Europa, one of Jupiter’s moons. The surface was imaged between 1996 & 1998 and is made up of a water-ice crust. Despite the cracks and streaks that you can see in the video, Europa actually has the smoothest surface of any object in the solar system. These images are not super high-res because they were taken with equipment designed and built in the 80s. But we’re going to get a better look at Europa soon…both ESA’s JUICE probe and NASA’s Europa Clipper are planning on imaging the moon in the next decade. This newly released photo of the chaotic clouds of Jupiter would make a great marbled paper pattern. NASA’s Juno spacecraft took this color-enhanced image at 10:23 p.m. PDT on May 23, 2018 (1:23 a.m. EDT on May 24), as the spacecraft performed its 13th close flyby of Jupiter. At the time, Juno was about 9,600 miles (15,500 kilometers) from the planet’s cloud tops, above a northern latitude of 56 degrees. You can view a “charmingly British” short film about making marbled paper right here. Processed using low resolution color images (IR, Green, Violet) from March 29 1998 overlaying higher resolution unfiltered images taken September 26 1998. Map projected to Mercator, scale is approximately 225.7 meters per pixel, representing a span of about 1,500 kilometers. Seán Doran shared some recently processed photos of Jupiter that he worked on with Gerald Eichstädt. The photos were taken by NASA’s Juno probe on a recent pass by the planet. These are like Impressionist paintings…you could spend hours staring at the whirls & whorls and never find your way out. There are more images of Jupiter in Doran’s Flickr album, including this high-resolution shot that you can download for printing. NASA’s Juno spacecraft is currently orbiting around Jupiter and taking some of the best photos and scientific measurements we’ve seen of the solar system’s largest planet. The photo above is of Jupiter’s south pole, gathering point for massive cyclones. Early science results from NASA’s Juno mission to Jupiter portray the largest planet in our solar system as a complex, gigantic, turbulent world, with Earth-sized polar cyclones, plunging storm systems that travel deep into the heart of the gas giant, and a mammoth, lumpy magnetic field that may indicate it was generated closer to the planet’s surface than previously thought. Using data and photos from Juno, Gerald Eichstädt and Seán Doran have created these videos that approximate what it might look like flying by Jupiter in a spacecraft. After a voyage from Earth lasting almost 5 years, the Juno spacecraft successfully entered Jupiter’s orbit late last night. The engine burn was tense. 35 minutes is a long time for a spacecraft burn; after 20 minutes it had slowed Juno enough to be in orbit, but not the correct one. It had to continue for another 15 minutes to put the spacecraft on the correct orbit. It worked essentially perfectly. The burn time was off by just one second. That will have no real effect on the orbit. The 35-minute burn slowed Juno down by more than 1200 mph. Launched from Earth in August 2011, the Juno probe is due to arrive at Jupiter on July 4, 2016. Once there, it will circle Jupiter 37 times, observing its atmosphere and magnetic fields, before plunging into the giant planet so as not to contaminate Europa with microbes. Juno will let us take a giant step forward in our understanding of how giant planets form and the role these titans played in putting together the rest of the solar system. Science is great. That video? Maybe not so much. One of these images is of Europa, Jupiter’s icy moon, and the other eight are frying pans. Can you pick Europa out? Hint: frying pans tend not to have impact craters. Jupiter’s Great Red Spot is becoming more of a Medium Red Spot. 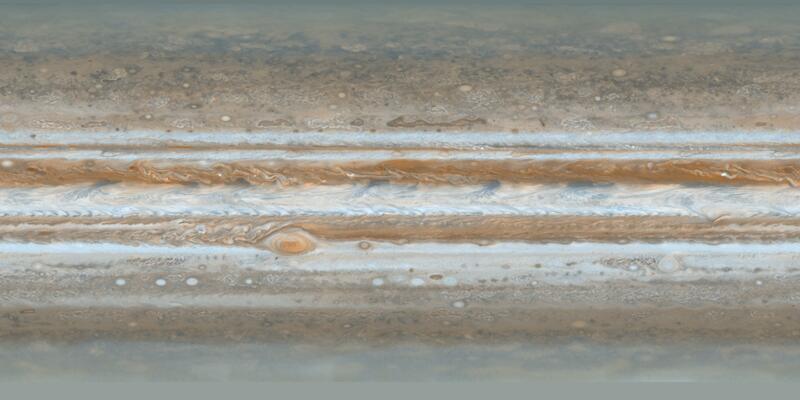 The gas giant’s signature beauty mark was recently measured by the Hubble as spanning 10,250 miles across its widest point, down from a high of 25,500 miles across. “Recent Hubble Space Telescope observations confirm that the spot is now just under 16 500 kilometres across, the smallest diameter we’ve ever measured,” said Amy Simon of NASA’s Goddard Space Flight Center in Maryland, USA. Amateur observations starting in 2012 revealed a noticeable increase in the spot’s shrinkage rate. The spot’s “waistline” is getting smaller by just under 1000 kilometres per year. The cause of this shrinkage is not yet known. Clive Thompson recently saw the moons of Jupiter with his own eyes and has a moment. I saw one huge, bright dot, with three other tiny pinpoints of light nearby, all lined up in a row (just like the image at the top of this story). Holy moses, I realized; that’s no star. That’s Jupiter! And those are the moons of Jupiter! I’m a science journalist and a space buff, and I grew up oohing and aahing over the pictures of Jupiter sent back by various NASA space probes. But I’d never owned a telescope, and never done much stargazing other than looking up in the night unaided. In my 45 years I’d never directly observed Jupiter and its moons myself. So I freaked out. In a good way! It was a curiously intense existential moment. For my birthday when I was seven or eight, my dad bought me a telescope. (It was a Jason telescope; didn’t everyone have a telescope named after them?) We lived in the country in the middle of nowhere where it was nice and dark, so over the next few years, we looked at all sorts of celestial objects through that telescope. Craters on the Moon, the moons of Jupiter, Mars, and even sunspots on the Sun with the aid of some filters. But the thing that really got me, that provided me with my own version of Thompson’s “curiously intense existential moment”, was seeing the rings of Saturn through a telescope. But seeing that with your own eyes through a telescope was a different thing entirely. Those tiny blurry rings, visible from millions of miles away. What a thrill! It’s one of my favorite memories. Would a lava lamp work on Jupiter? He used the accelerometer on an Android phone to measure the G force. Jupiter is growing another big red spot. Jupiter is growing another big red spot. The gas giant has been told by solar system pals to “keep an eye on it” and “have it checked out” if it gets any bigger. We’re still finding lots of new moons around the planets in our solar systems. Twelve new ones were just discovered around Saturn and Jupiter now has 63.